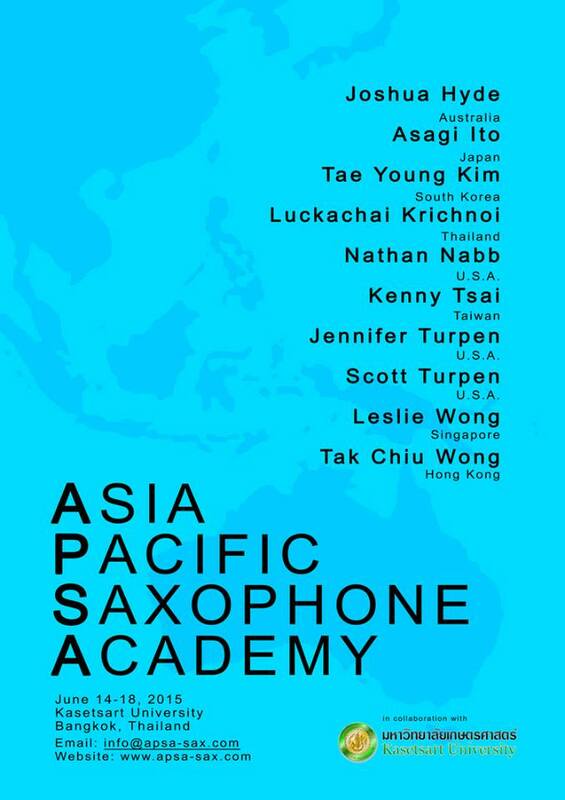 Amigo Saxophone Quartet in collaboration with the Department of Music, Kasetsart University brings to you the Asia Pacific Saxophone Academy 2015 at the Chulabhornpisalsilp Building, Kasetsart University, Bangkok, Thailand . For five full days on 14-18 June 2015, 54 saxophonists will be able to work closely with the faculty in a variety of settings including lessons, lectures,, master classes, and ensembles. 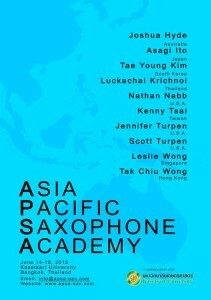 Faculty for APSA 2015 includes Joshua Hyde (Australia), Asagi Ito (Japan), Luckachai Krichnoi (Chulalongkorn University, Thailand), Wong Tak Chiu (Hong Kong), Leslie Wong (NAFA, Singapore), Kenny Tsai (TNUA, Taiwan), Tae Young Kim (Myung ji University, Korea), Dr. Nathan Nabb (SFA University, USA), Dr. Scott Turpen (University of Wyoming, USA) and Dr. Jennifer Turpen (University of Wyoming, USA).